Butter, coconut oil, olive oil and vegetable oils are a couple of different fats. Triglyceride is the chemical name for what we in daily speech call fat. 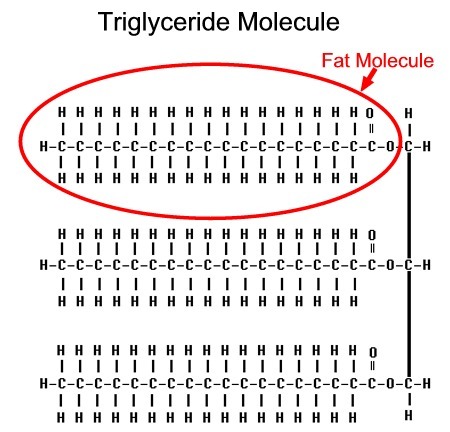 A triglyceride consists of a glycerol head (derived from glukose/sugar) and three tails fatty acids. When the body stores extra energy it preferably puts it away as triglycerides in the adipocytes (fat cells). The fatty acids can be saturated, monounsaturated or polyunsaturated, all depending on the ratio between carbon and hydrogen atoms in the molecule. If every carbon is filled with hydrogens the chain will be straight and there will be single bonds between the carbons, making it very stable. If there is one or more missing hydrogens there’ll be double bonds int the chain, making it bend at the doubles and also making the chain less stable. Every triglyceride contains various amounts of these fatty acids, and the fats will have different properties depending on the rates between the fatty acids. The more saturated fatty acids there is the more solid the fat will be, for example butter and lard. This is because the chains are straight and easy to pack tightly and also have a higher mealting temperature than unsaturated fats. They also don’t turn rancid as easily, which is why they are better to cook with since the fats wont be destroyed. Oils contains high amounts of mono- and polyunsaturated fatty acids and therefore have a lower melting temperature and are fluid in room temperature. They more easily go rancid and will be destroyed by high temperatures. Next postCholesterol – good or bad?